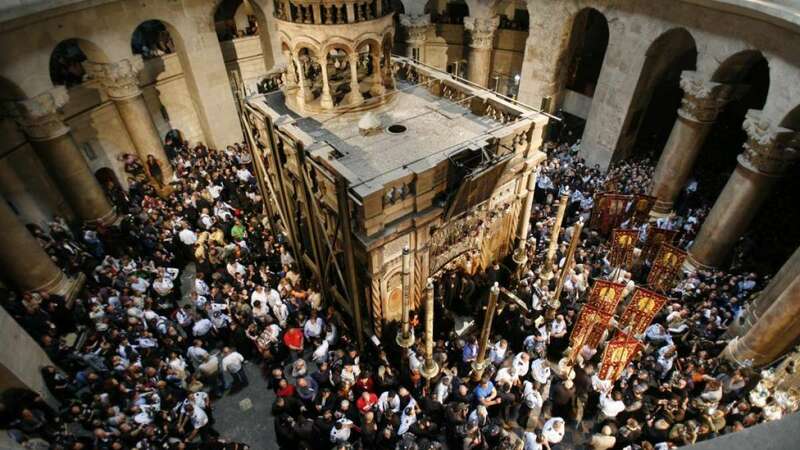 Los angeles : In a first for Christians across the world, preservation experts have opened Jesus's tomb inside the Church of the Holy Sepulchre in Jerusalem for the first time in at least two centuries. The historic work was uncovered as part of ongoing restoration at the site. It is believed that the site contains the rock upon which Jesus was laid in around 33 AD. According to experts, the marble covering the site has been removed for the first time since at least 1810 as part of both restoration work and archaeological analysis. The last restoration work took place following a major fire. The place is considered among the holiest in Christianity. A painting of Jesus can be seen in the narrow area above where the marble slab was removed. The whole restoration work has been documented by the National Geographic and is being carried out by a team of Greek specialists. The National Geographic reported that "the exposure of the burial bed is giving researchers an unprecedented opportunity to study the original surface of what is considered the most sacred site in Christianity". Three main Christian denominations of the Holy Sepulchre — Greek Orthodox, Franciscans and Armenians — are funding the whole restoration with some additional funds from other public and private contributions.